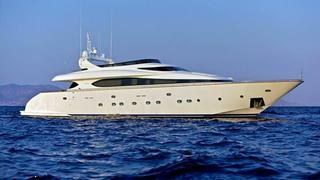 News just in from Michel Chryssicopoulos at Cape4 Yachting of a €350,000 price drop on the 31.49m motor yacht Marnaya. A Maiora 31 DP, she was built in 2010 and accommodates up to 12 guests in three double staterooms and two convertible cabins with Pullman berths. Twin 2400hp MTU engines give Marnaya a cruising speed of 26 knots. Lying in Athens, Marnaya is down from €6.5 million to €6.15 million.